Resource Techniques has recently published articles on estate agents branching into online video to market their properties. Two such articles include, 'YouTube upgrading to HD' and 'You've heard of SEO, but what about YTO'. The feedback was outstanding and it was clear that a few estate agents are uncertain on which camcorder to get this Christmas. Now let's be honest here, when considering a camcorder HD (High Definition) is certainly worth the money. It has substantial improvement in video quality from normal camcorders and with YouTube upgrading into HD, marketing properties through the medium of video will no longer look amateurish. Sanyo was founded in 1950 and translates from Japanese as 'Three Oceans' because of its target to be a worldwide distributor. Now a subsidiary to Panasonic, Sanyo creates middle of the market electronics goods. The website even gives you tips on how to use the Xacti and different settings estate agents can use for individual situations. Disappointingly, the grammatically incorrect link 'Shooting Baby' was not a baby with an AK-47 or at least a water gun. 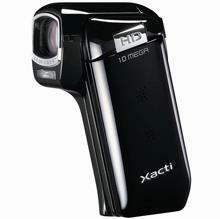 The Xacti camcorder shoots video up to 7 frames per second and at an impressive 10 Megapixels. It has an optical zoom of 5x, a 3 inch LCD screen and has a recording time at the highest quality of 3 hours and 51 minutes! The Xacti is a camcorder that looks like a stylish Phaser from a distant Star Trek future. Therefore set your faces to stun when you hear the price at around £150! Now things are getting a bit more serious. Canon is a well known and established household name when it comes to digital imaging. This camcorder has a monstrous 64GB of memory to play with which is more than many poor quality computers! This means that the camcorder has a can record a whopping 24 ½ hours of video, which is perfect for estate agents who have to profile more properties than they know what to do with (shame that the battery life only lasts 1 hour 45 minutes). The lens itself has a 10x optical zoom, an 8 Mega pixel HD camera system and the screen is a 2.7 inch LCD widescreen. This camera has only been released recently and is tipped to be Cannon's off-the-shelf flagship camcorder for and is available from around £1049. Our estate agent rating: 4 Estate agents out of 5! 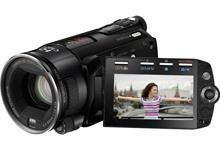 Compact and hailed as the world's lightest full HD camcorder, the Panasonic HDC-TM10 gorgeous as well as sleek. Many reviews have stated that they have 'forgotten' that they were holding it which is perfect for estate agents that are going to put their whole portfolio onto online video. It has a 16x optical zoom whilst recording in HD and has a tiny weight of 227grams. Resource Techniques estate agent rating: 4 estate agents out of 5! As many are aware, Sony is known as one of the largest consumer and professional electronic equipment. 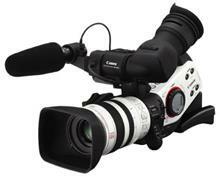 Its current slogan is make.believe and this camcorder is going to make you do just that. The Sony PMW-EX1 is definitely in the professional end of the camcorder market and is not for beginners. The specs include; 14x optical zoom, 25 or 30 frames per second and has a 2.5 inch LCD screen with a combined (plus the battery) weight of 2.8kg. With a price tag of around £4,000, this camera is serious stuff. Resource Techniques unique estate agent rating: 5 estate agents out of 5! This is about top range as you can get and is known as the professional's choice. The Canon DM-XL2 has 3 CCD's which means that light entering the lens is split into 3 different devices measuring red, blue and green light. Let's be honest here, there are more dials, switches, buttons and lens than the amateur videographer can handle. Estate agents with a hobby of camcorders will know of this camcorder's status within its industry and its state of the art DV imagery. Many online reviews have mentioned that the ergonomics are slightly awkward and that it is much pricier than the competition. At £4000, you might need dip into your savings for this one.